On our walks these last couple of days, Freddie the Labrador has insisted on walking along the field where the hay has recently been cut and turned into beautiful round bales. They smell divinely of summer, sweet and warm with a sprinkling of sunshine and look particularly beautiful arranged in a string like a necklace of country pearls along the edge of the field. It is certainly a lovely landscape around here Maverick, a beautiful mix of vines and arable land and even the occasional cow! Beautiful landscape shot Jane. I just love ‘curly’ hay bales. In my part of the Chiltern Hills they are sadly no longer to be seen 😦 Our farmers’ machinery cuts, bales, stores the hay/straw inside the huge contraption, no longer even throwing out square bales – that’s progress, supposedly. Not good for photographers though! They are real signs of summer, I love them! Lovely photos and beautiful writing. Thankyou very much radicalrambler, much appreciated! Wonderful! 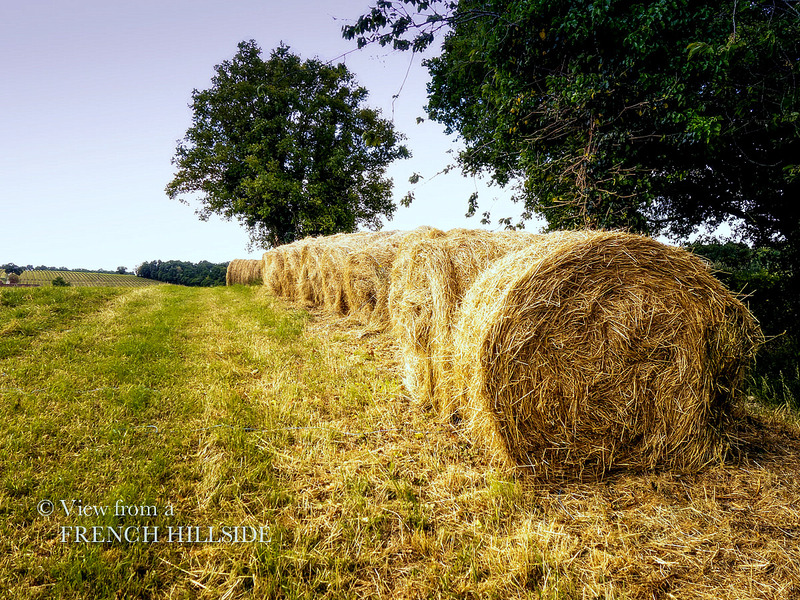 It would be so good to walk down that lane and smell the hay! Thankyou! It is my favourite walk with Freddie the labrador !